A brief introduction to Imam Al-Ghazali’s life, and then situating the Ihya within that and touching on its aims and format. Overview of kitab al-aqa’id, touching on its methodology (in light of its use of the Greek heritage), and touching on the warnings in Iljam al-awamm and how they relate to the principles of the Ihya). 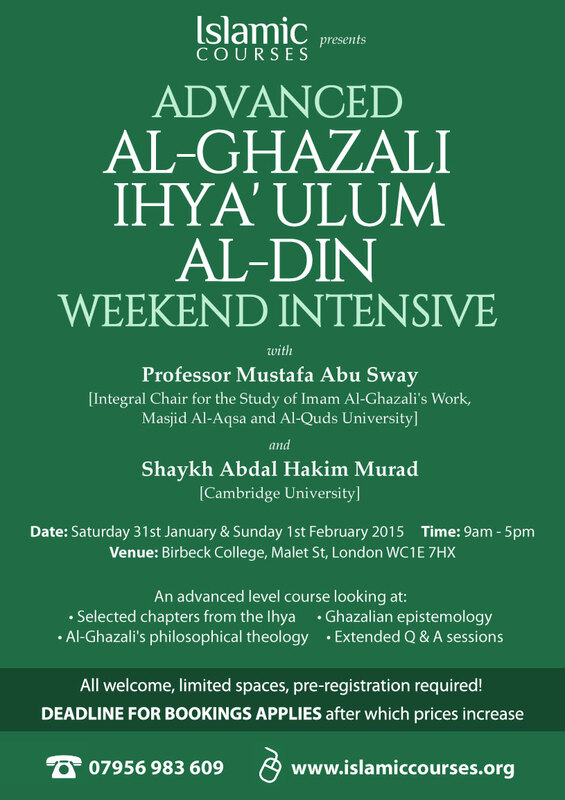 As the course is aimed at the advanced level, participants must be familiar with the basics of Imam Ghazali’s life, work and thoughts, familiar with the Ihya, and reasonable understanding of kalam, metaphysics, philosophy, and epistemology as well as other Islamic sciences. Professor Mustafa Abu Sway has recently been appointed as the first holder of the Integral Chair for the Study of Imam Ghazali’s Work at Al-Masjid Al-Aqsa and at Al-Quds University. He is Professor of Philosophy and Islamic Studies at Al-Quds University in Jerusalem, Palestine, since 1996. He earned his BA and MA from Bethlehem University and PhD (1993) from and Boston College, USA (Dissertation: The Development of Al-Ghazali’s Genetic Epistemology. He taught at the International Islamic University in Malaysia (1993-96), and was a visiting Fulbright Scholar-in-Residence at the Wilkes Honors College at Florida Atlantic University (2003-4), as well as a visiting professor of Islamic Studies at Bard College, NY (Fall 2008 and 2010/2011). Among his published works are two books: Islamic : Epistemology The Case of Al-Ghazali (1995) and Fatawa Al-Ghazali (ISTAC, 1996). His area of expertise are Islamic Philosophy, Studies on Al-Ghazzali, and Islamic Epistemology. In 2001 he was the Winner of Science and Religion Course Award, The Center for Theology and the Natural Sciences, Berkeley, CA, NY. Born Timothy John “Tim” Winter but also known as Shaykh Abdal Hakim Murad, was educated at Cambridge, Al-Azhar and London universities. 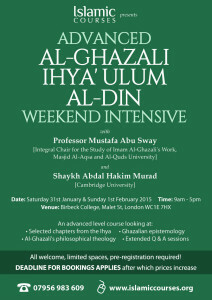 He is currently the Shaykh Zayed Lecturer of Islamic Studies in the Faculty of Divinity at Cambridge University and Director of Studies in Theology at Wolfson College and Dean of The Cambridge Muslim College. In 2003, he won the Pilkington Teaching Prize and 2007 he won the King Abdullah I Prize for Islamic Thought. He has published and contributed to numerous academic works on Islam, including as Director of the Sunna Project , and is a leading figure in inter-faith activity, notably as one of the signatories to the Common Word statement . He is well-known as a contributor to BBC Radio 4′s ‘Thought for the Day’.